The Monkees have a new album!! 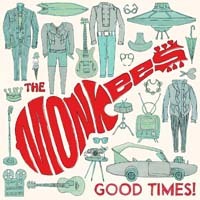 It's hard to believe but there's a new Monkees album of all new material. Good Times was released on May 27th, 2016 and featres 13 new tracks. Micky, Mike and Peter all perform and an unreleased Davy tune was added to the album. Reviews have been fantastic. They've even released a video for the first tune "She Makes Me Laugh"
Micky and Peter are also touring for the 50th Anniversary. See the dates and get tickets via Live Nation. Looking for some Micky stuff? Then visit Micky's store at Micky Dolenz Direct where you can purchase personalized autographed items or send in their own items to be autographed. Keep up with the latest Micky news on his Facebook page! All graphics, text and design, unless otherwise noted, are copyright Andrea "Hoo" Chempinski and may not be used without express permission.